Featuring mostly unpublished material and other rarities from some of America's Finest Creators. 49 contributors - 80 routines and moves. The cards are now riffled past Ted's eyes, asking for him to say, "stop." Now, with Ted remembering his card, Mary shuffles the cards with great care. Without looking though the deck, you cut to the card you believe to be Ted's card. You offer to reveal the selection, but instead you decide it would be better if Mary, who could not have seen it, reveals the card. You place the card in a visible place and ask her to try to use her mental powers to guess its identity. Although the Dr. Jaks "Dictionary Trick" was described in The Sphinx in 1949, it did not come to my attention until Karl Fulves published an extensive retrospective on it in his magazine Latter Day Secrets (Issue No. 6, 2001). Although the trick would appear to knowledgeable magicians to employ the one-ahead principle, it in fact employed a two-ahead principle, which made it all the more baffling. The refinement I offer here retains the two-ahead method but makes it appear to spectators that you could never have been "ahead" at all. Here's a quick, red/black, false, tabled Riffle Shuffle. The magician has a card freely selected from a blue deck of cards. Something happens. The card suddenly changes into a red card. "Let's try another card," says the card handler. A second card is freely selected and remembered. In a flash, the entire blue deck is transformed into a completely RED deck. Every single card is shown to be red, except one card. He missed one. But wait. What if that one blue card was actually the selected card? It is! There's more. In the blink of an eye, this blue card suddenly changes into a red card to match the rest of the deck. I just discovered something after many years of doing the same thing over and over. It's nice to know that we all still learn, or at least some of us still do. This is a version of Peter Kane's Gypsy's Curse using non-gimmicked cards. Many years ago, I saw Christian Stelzel perform and teach The Thumb Slide from Hugard and Braue's More Card Manipulations, Series 3. Those authors credit it to Prof. Hoffman's description of a move by Carl Hartz. I began learning to do the move, but I kept missing the slide of the selected card to the top of the pack. Happily, the miss produced a very cool result; the card was pushed directly into gambler's cop position in a natural and easy action. 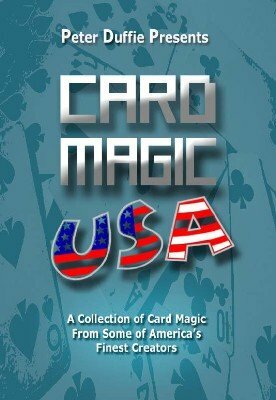 We have $1.00 stores in town that sell many beginners' magic tricks. I bought some marked cards, stripper decks and Svengali decks for only $1.00 each. The following is a very effective mental trick using the $1.00 Svengali deck. This is a prediction effect featuring a five-card variation of the Corvello force. The following idea is a Hold'em stack for seven or eight hands with one Faro Shuffle. It is designed to fool a card man. A spectator chooses a card (totally free choice) and remembers it. The card is fairly cut into the middle of the deck. The magician picks up a borrowed bill and says, "Now, watch carefully as George (Washington) performs his magic." The bill is folded. The magician blows on the bill. When it is unfolded, there is now a huge hole where George's portrait was! The magician spreads the deck. George's portrait is discovered on the back of one card in the deck. The card is turned over and seen to be the selection! The card is left face up on the table. The magician continues, "Obviously, George is a busy guy and can't stay on the back of your card." The magician folds up the bill and waves it over the card. The spectator turns the card over, and the portrait has vanished. The magician unfolds the bill. It is now fully restored and handed back to the spectator for complete examination. An 18 page treatise on the Jennings Visitor plot, featuring My Visitor II and The Discolored Visitor. My thought processes resulting in this effect were spurred on by David Jade's "Cutting off Colors" from the March 2004 issue of MAGIC magazine. I felt that the Mechanical Reverse could be eliminated. I also wanted to reduce the bulk of the cut-off cards by using a gimmicked card. "The Cheesy One-hand Top Palm Control" is something I have used for a long time to control selected cards. Give it a try. "catching a spectator's thoughts" (reading his mind), you tell him from which of three shuffled piles of cards a thought-of card has been removed and into which pile it was then inserted. (Three piles for one spectator; 3-4-1.) For the "kicker" ending, you name the thought-of card. The effect here is that two "special" cards find and sandwich three free selections, one at a time. This is based on an effect by Karl Fulves, called "Naming the Aces," that appeared in Self-Working Card Tricks. Ryan has added a bit of equivoque and a card-to-pocket ending. This is an extension of John Bannon's "Last Man Standing." One card - a prediction - is taken from the deck and laid aside, face down. Three other cards are then removed, and the rest of the deck is set aside. Esperanza and Eduard are asked to think of any one of the three cards. The cards are shown first to Esperanza, one at a time, and then to Eduard. Esperanza is asked to name the card of which she is thinking. She says the Three of Hearts, which only makes sense, because she saw three Threes of Hearts when she was shown the cards! Then, Eduard is asked to name the card of which he is thinking: the Seven of Hearts - for all he saw was three Sevens of Hearts. Some confusion arises from these disclosures, but the performer clears it all up by adding Esperanza's Three to Eduard's Seven, arriving at ten. And because they have both thought of hearts, the Ten of Hearts is the result; and the prediction card proves to be just that! The performer then comes clean. "I cheated. I really gave you no chance to come up with anything but ten." With that, he flips the three cards with disputed identities face up. They are now all Tens - Clubs, Diamonds and Spades! This force uses the Adrian Plate Clip, which was first published in Magician's Tricks: How They Are Done. Jim also explains further applications, including Spectators Find the Aces, and The Cardman Makes Good. After selecting a card, a spectator follows a set of blackjack rules printed on a blank card. In the end, the spectator's card magically appears on the card where the rules once were. Two spectators, preferably a man and a woman (in a relationship), each select a card. The man, without knowing the identity of the card he chooses, signs its back. The woman chooses a known card and signs its face. Both cards are lost in the deck. However, the performer says that the man's selection will locate the woman's card. The deck is spread face down to locate the man's signed card and to see if it "attracted" the woman's selection. The card signed on the back and the face-down card next to it are removed from the spread. When they are turned over, it turns out that the man's selection successfully attracted the woman's selection. To further strengthen their apparent "bond," the magician transfers the man's signature from the back of his selection to the back of the woman's selection. They are now "fused" onto a single card. Everything may be examined. This is an easy version of the classic "Coin Cut" from U. F. Grant's 50 Kute Koin Tricks (1940). This is a handling of J. C. Wagner's "Collect Twist" (Paul Harris's Supermagic, 1977). The following version was inspired by Ian Land's "Second Direction" (Pabular, Volume 7, Number 11, 1983, pp. 1131-1133). This version eliminates the post-collection displacement that is used in most of the published methods (see: Bibliography). This method also allows you to spread the packet to display each reversal. A spectator is asked to think of any card and to call out the name of the card. An ungimmicked, face-down deck is handed to the spectator. The spectator is instructed to spread the face down cards between their hands. In the middle of the spread cards is a single face-up card. It is the spectator's thought-of card. Introducing the cased deck, you remove the cards and place the box aside. Turning the deck face up, you spread through until you come to the Joker, placing it onto the table. The deck is set face down onto the table. You introduce the "blindfold" and cover the deck. The spectator now reaches under the cloth, removes a card from the center of the deck and places it, face up, on top of the deck. You now pick up the Joker, place it under the cloth, and allow it to examine (?) the deck. You bring the Joker out and hold it to your ear, and it tells you the name of the spectator's face-up card. As a bonus, the Joker tells you to turn the card box over, revealing the Queen of Hearts on the Post-it Note! This is the same basic effect as "Tel-Tale Joker," but it uses an entirely different method. A card is signed on the face and, when blown upon, goes blank. The same card then re-appears face up in the middle of the deck. The deck is blown upon, and all of the cards then go blank. The signed card's back also changes and reveals a humorous message. The spectator is left with their signed card, which also contains your contact information. The magician introduces four red-backed Kings and four blue-backed Aces. The cards are marked to help the spectator follow the cards by their backs. The Kings are placed under the card box while the magician holds the Aces. One by one, the Aces change into the Kings. For the finale, the cards change back into Aces. The Kings are found back under the box where they began. Thoughts on Vernon's Out of Sight - Out of Mind. Thoughts on Roy Walton's Overworked Card. Thoughts on Vernon's Matched Spell Out. Gene's handling of the 'Hotel Mystery' effect. A spectator removes a card from a face-down spread of cards. Another spectator names a number between 1 and 8, inclusive. A playing card is torn into bits and pieces and laid out onto the table. The two pieces that correspond to the spectator's named number are turned over, and they are the only two pieces that could possibly show the identity of the card. 1st edition 2010; 286 pages.